We just got the news here, NANOHA Detonation is scheduled to be released in 19 October. The news comes from official activities "Lyrcal Party 6". So far, I have very little information and other related resources. So I sent you here to see how you comment. I just only wish that this part 2 Reflection will not too much focused on Nanoha only, at least consider on Hayate more since Fate have more appearances than her. Which is made me sad to watch Hayate only cover so little in the part 1 movie. But not only Hayate part, I really want to watch how those 3 new characters from Book of Darkness will act and how they are going to do next. And what will happen next after the Detonation movie if they decided to show us the epilogue of this movie, just like as usual for previous 2 Nanoha movies. Or some sneak peek too. Too bad that we have to wait not on October but later if we are overseas/not Japan Nanoha fans to watch this movie. But at least this is the conclusion of whole Nanoha Reflectnation movie story we have waited so long. I really hope that future will have Hayate (Detonation) version of figurine for me new collection of her though. I think you might like Hayate. Character Hayate has already played a long time in NANOHA StrikerS and VIVID. And in this movie, She plays the supporting role of one of the leading characters at the same time as last time. That is to say, she might play an auxiliary role. There's nothing particularly important for this. And a character Dearche similar to Hayate has appeared. Dearche was a completely irascible character, and she's a rival. Because I used to play PSP games, so I probably know that the movie's ending may be a planetary Eltria reconstruction. As for Nanoha and Fate, Hayate et al of them may continue to live a normal life. On the latest Detonation PV (https://www.bilibili.com/video/av18188617), It has been passed on to Chinese network. So they make subtitles based on this video translation. "遇到了重要的人，遇到了温柔的人，那真是非常幸福的事。但是，也有没能帮助的人，没能拯救的人，那是非常悲伤的事情、痛苦的事情。我再也不会让这种痛苦的悲伤的事情发生在我面前了。所以，这次一定能成功。(English: I have met an important girl, and a gentle girl. That was really a very happy thing. But I haven't been able to help woman, and I couldn't save woman. That was a very sad thing, and a painful thing. I will never let this sad and sad thing happen to me. So, I'll be successful this time.)" After Nanoha Detonation in cinemas at October 19 2018. The next project will be 15th anniversary of Magical Girl Lyrical Nanoha Series at 2019, i suggest to Masaki Tsuzuki will adapt Nanoha Force into films and sequel titles in TV called Magical Record Force Destiny which is set as the fall of Special Duty Section 6 and is return to set on Earth. This is speculation and not official information, right? I don't think I have heard any announcements about 2019. This is the updated movie ticket information in August. Is this Nanoha Detonation event notification? August 10th selling tickets at Nanoha event, while selling tickets officially widely is at August 18. And question is, that tickets are for which country/region cinema or theaters? And all 3 above is just souvenirs of Nanoha detonation, right? If i'm not mistake the Chinese and Japanese information. Of course, the film is the first to be shown in Japan. There is no news about Mainland China's import of the movie. The previous film NANOHA Reflection have been shown in Hongkong and Taiwan, and Only the Mainland China has not been shown. The film NANOHA Detonation is unlikely to be shown in the Mainland China. After Japan was released, it's also possible to export to Hongkong and Taiwan. These souvenirs and tickets are all officially ready to sell at C94. I just translated it from the official website of Japan ,and it show Mainland Chinese fans (https://tieba.baidu.com/p/5827858638). But no one has yet to reply. Personally, I'm afraid I can't go to Japan to buy those things and watch movie. Well, the good part for you is Hong Kong and Taiwan will be earlier release than mine in Malaysia (a.k.a Worldwide) after Japan release. But still, I can understand Chinese (Subtitles) so the worldwide English subtitle release date is not really a big problem for preventing me to watch Nanoha Detonation early. Well I could say is Early Access term for me though. Actually, I remember what I said to Mainland Chinese fans. "好的，謝謝合作。還有如果你要搞懂整個奈葉系列的話，更嚴格地來說，光是有技術問題可能還是不夠，需要先懂日語和英語為基礎，再接著購買奈葉系列相關書籍為經濟成本等條件才能達到。而普通人也只是看看動畫或其他已知公開的資料資源而已(English: Well, thank you for your cooperation. And if you have to read all NANOHA series, there is a more rigorous approach. Because you only have the technical method may not be enough, and you also need to understand Japanese and English first, then go to buy NANOHA series books related to economic costs and other conditions, in order to achieve the goal. Ordinary fans only enjoy Anime or browse other publicly available information and resources.)" So I also understand and support their interesting patterns for NANOHA series. Update official website news, they have updated OP and OST in 12 September. The theme song is still sung by Nana Mizuki, it the song named "NEVER SURRENDER", it's also her thirty-eighth single CD. This CD also contains a movie interlude "GET BACK". It is expected to be on sale in 24 October, and priced at1204 yen including tax. The cover of CD has not been determined yet. It's the same as the OST sale time. The cover of OST has been identified. The characters in it are Fate and Kyrie. I thought of the characters in the cover of OST that came out last time, that is Nanoha and Amita. I don't know when the next time the characters on the OST cover will have Hayate and Iris. It is said that OST also plans to include four character songs in it. One of character songs is used for the ending song. At the moment, I don't know what those songs will be like. The action looks pretty good, looking at this I wouldn't be surprised if this movie has even more fight scenes than the first one. Nanoha and Fate's combined attack at the end looks fantastic. I read Reflection Official Guidebook again. The book says that the plot starts from Iris's backgrounds. The plot may include her relationship with U-D. I think Iris must be a villain like Precia else. I'll take another look at this trailer. I feel the cruel plot is too scary. I think Iris's background may be an engineer or an experimental human sample. Otherwise, she might not be able to bear that kind of cruelty. I think that movie Reflection is like revenge when Iris finds U-D. At present, we do not know what has happened between Iris and U-D, and then them have been some battles. Maybe those scenarios may appear in this movie. I can't go to Japan to watch movies for personal reasons. But I am still waiting for the film to be introduced to Hongkong and then watch it. These are the goods that were updated in 12 October, and those are make and sell by Shochiku for NANOHA Detonation. These goods will be sold first in the cinemas. Again, they will communication sales and online sales. 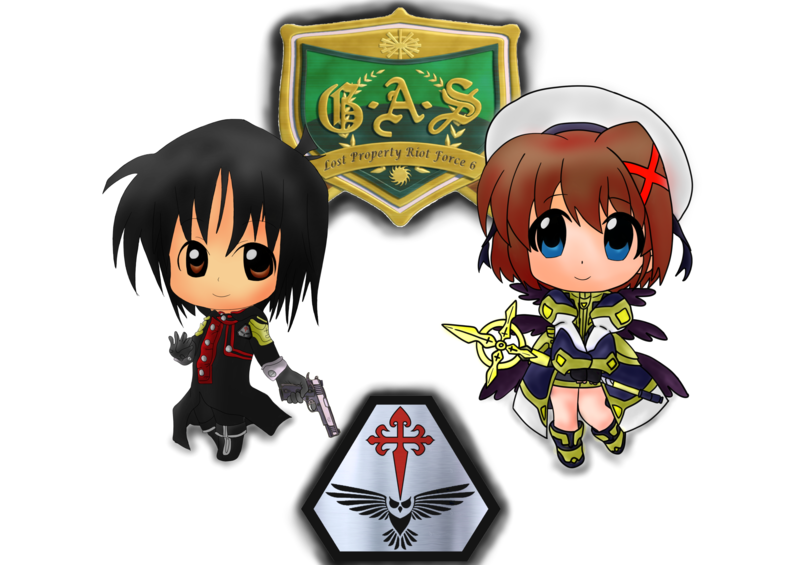 【フラッシュキーチェーン】Flash key chain (Version Nanoha and Fate and Hayate). These pieces are priced at 1500 yen including tax. 【クリアファイルセット】Clear file set. The price is 600 yen including tax. 【Ｂ2タペストリー】B2 Tapestry. The price is 3000 yen including tax. 【3Ｄポスター】3D poster. The price is 1200 yen including tax. 【光るジグソーパズル】Glowing jigsaw puzzle. The price is 1500 yen including tax. 【ペーパーナイフ】Paper knife. The price is 2500 yen including tax. 【レイジングハート　キーホルダー】Raising Heart Keychain. The price is 1400 yen including tax. 【バルディッシュ　キーホルダー】Bardiche Keychain. The price is 1400 yen including tax. 【クッションカバー】Cushion Cover. The price is 2500 yen including tax. 【ブックカバー】Book cover. The price is 1500 yen including tax. 【ＵＳＢカード】USB card. The price is 1800 yen including tax. 【マルチツール】Multi tool (Version Nanoha and Fate and Hayate). These pieces are priced at 3500 yen including tax. 【キャップ】Cap (Version Mid pink and Mid yellow). These pieces are priced at 3500 yen including tax. 【豆皿コレクション】Mamezara Collection. The price is 2800 yen including tax. Sorry, this Taiwanese website is not very stable in Hongkong and Shenzhen. So I can not access it. And I'm just browsing the open web resources. If I or others ask for something more pure, Probably only to access Japanese websites. And I myself may be just a middleman communicating with fans. Thank you for your web address. Since you already know, Why not translate it earlier into English or Chinese? It is written in Chinese. If I translate into English, I will not be able to bear the pressure. Because people here can read it, so send it forward. Mhm q.q any good NanoFate stuff? Did Fate get some Nanolove after getting impaled at the end of reflection? Update news came from Proware Multimedia International Co., Ltd official website home page. Magical Girl Lyrical Nanoha Detonation to be shown in Taiwan, and before the film was released in Japan, the news had come out. But they don't have Blu-ray "Magical Girl Lyrical Nanoha Reflection" on sale. They sell less related goods than Japanese and Mainland Chinese, Especially when Mainland Chinese sell pirated goods and dojin goods. The price of the movie ticket is NT $650, that's about 150 yuan of RMB in Mainland China. And that's NT$100 more than previous "Magical Girl Lyrical Nanoha Reflection" tickets. The goods attached to the ticket are Seven-color Flash Magic Array LED lamp holder (Chinese: 七色炫光魔法阵LED灯座) style A and B. Among them, style A is purple from Nanoha and Fate, and style B is White from Hayate. If their conditions are met, you need to buy two tickets to choose the goods at will. I don't know which one you like to choose. Incidentally, Because the previous "Magical Girl Lyrical Nanoha Reflection" were first screened in Hong Kong and then in Taiwan. If the film "Magical Girl Lyrical Nanoha Detonation" is to be shown in Taiwan, there is a possibility that films will be shown in Hong Kong. But GoldenHarvest website has not been updated with relevant information. I don't rule out that they will be showing films later than Taiwan. In this regard, are fans in Hong Kong looking forward to the film? Nanoha Detonation had released in my country. This is pure day 1 release and my brutal honest review, “I LOVE IT!!!”. But for those who are the fans who likes more on Hayate-Chan like me will disappointed a little, and not to mention for those who have fetish (you pervert) on Stern, Levi, and Dearche will find very shock truth their true origins (Try to reconsider whether you still want to continue have them as your waifu ͡° ͜ʖ ͡°). At first, I do have doubt that whether the author will screw around Nanoha Franchise by adding insulting bias opinions on magic vs tech, will Hayate-Chan hatred more on technology, will villain be acting very stupid with no common sense on warfare and etc. But in the end, not one at all. SPOILERS AHEAD!!! FOR THOSE WHO HAVEN’T WATCH, PLEASE LEAVE. The first intro of this movie is flashbacking on reflection incident, then story continues. Later for what Iris did to Yuri, Stern, Levi, and Dearche siding with Nanoha and her friends. Before Yuri being brutally stabbed by Iris, she was able to give her tome of darkness memories to Hayate-Chan, it turns out that Yuri was a portion page from Hayate’s Tome page that fallen into the sea, forming crystals. Then, later being discovered by Arisa’s or Suzuka’s parents. Unfortunately, Yuri and Iris was being manipulated for the whole time. Tome Darkness page memories was heavily damaged but eventually fully recovered by Levi’s magic and maybe TSAB’s help. Turns out that Iris true name is “Jessica”, she is the clone made by a villain scientist. However, this scientist was very good at first and very passionate, but with the wrong decision by Eldria government to suspend their project on Restoration of Eldria planet, he become very depress and insane while keeping his cool. Later, he used violence to voice out his frustrations by using his new invention to kill every scientist. His new invention is Nanobots but appearances like Force “Raptors”. Nano-Raptors in this movie have many classes. Like (General Purpose, Specialist, Mini-bosses). Even though in the past, Yuri killed that scientist to stop him, but instead making the situation even worse. Using his telepathy to fool Iris that Yuri is the criminal for the causes. If you don’t know, actually Yuri is the last generation owner of the Tome of Darkness before Hayate-Chan. Tome of Darkness abilities is healing and resurrection of green biomes that caught many Eldrias’ scientists’ attention. Additional note, Yuri and Iris are best friends. That you could hardly view them as merely friends, their relationship is so close that have transform it into sister family relationship. Later story continues, like usual……. Communism quality mages always being get REKT. Even Levi told them they are really unreliable. And not to mention, they are ARMED FORCES!!! Armed Forces my A**!!! Even with their equipment upgrades. Nanoha and her friends tried to stop Iris and Yuri from furthering damages and troubles. Stern, Levi, and Dearche successfully stop Yuri’s first berserk by Iris, then the “TERMINATOR” villain appears, crippling 3 of them then abduct Yuri. Later he sends his biological virus to Yuri and Iris to accomplish his agenda. During Stern, Levi, and Dearche battle with Yuri, Yuri give them memories of their past. (YOU BETTER BE PREPARED FOR THOSE FANS WHO LOVE THOSE 3’S), actually those 3’s are cats were caretaken by Yuri and Iris. Which means they never have true body to begin in the first place. And his Nano-Raptors. General purpose raptors are easily crush, while specialist ones need other specialists like Signum, Shamal, Zafira, Fate, Hayate, and Nanoha to deal with them effectively. Specialist Nano-raptors are more human-like and more advanced AI that almost resemblance as human emotion. The terminator scientist had many production Nanobots facilities to pursue his agenda. In summary, Nanoha Detonation Villain is more strategic, manipulation, worst case scenario preparation, deadlier and more intelligent than last villain we saw in every Nanoha Franchise. Now that’s what I call “EVIL……….” Quality! Superb!!! Oh, by the way, this villain is totally like Deaths-head from Wolfenstein. He called Yuri and Iris is a good specimen. He also called Nanoha as perfect specimen due to Nanoha is stronger than him despite years of his many researches on his accelerator and his pain can be completed easily by Nanoha who have no expert experience on Accelator’s skills. Not to mention, Nanoha endurance on physical and magic is on par with him, or slightly better. The most awkward things he mentioned he wanted Iris, Yuri and Nanoha to become his children. You can really see his attitude is almost close as Deaths-head. At climax, Stern, Levi, and Dearche again confront Yuri’s manipulation by desperate villain scientist. In doing so, Levi and Stern transform themselves into energy then absorbed by Dearche. Aftersuccessful confrontation, Yuri was free from control then Stern, Levi, and Dearche returned to original cat form. Hayate successfully destroy all siege warbots, Signum, Zafira, Shamal, and Vita successfully confront Nano-Raptors specialist, and with the help from TSAB seizing all Nanobots manufacture facilities. Nanoha successfully defeating “Terminator”, then terminator had no choice but activating his worst- case scenario plan, by launching Ion Canon to destroy Tokyo while all protagonists are within the range. Ok, closing to the last part, Nanoha and Ammitie trying their best to fly to space to destroy Ion Canon Satellite, but to their unbeknownst, there was an ion Snipe Specialist guarding the satellite, had shot Ammitie down but she did not die due to her endurances and Nano-regeneration, so Nanoha left to destroy cannon satellite. After her successful destroying satellite with her Excellion Buster, about that sniper specialist, she was totally crippled and then holding/grappling Nanoha’s body then triggering self-destruct. Even with self-destruct, Nanoha still alive and talking to her younger self?!! Woah, “Immortal” X’D. She may look like she had lost her right arm but she’s not. After Hayate-Chan and Fate rescue her, all happy ending blah blah blah. Florian sisters, Yuri and Stern, Levi, and Dearche are going back to their home planet Eldria. Iris still have to stay at Nanoha’s home-planet due to accustomed by TSAB. Later Iris back to Eldria, then becoming into one big Florian sisters’ family with new members like Yuri, Stern, Levi, and Dearche. During the ending, Nanoha and her friends graduated from elementary school, then showing final clip of Florian sisters are around 18 years old and have successfully restoring Eldrian planet. Oh, and don’t worry about their father, because Yuri have special ability of healing and medication their father still alive and very healthy. One final part, Stern and Dearche have grow long hair during their living on Planet-Eldria. And the disappointment for Hayate-Chan fans like me, she is even more lesser appearances than Reflection movie. I think the Author knows about that, so he showing more on Cute Hayate-Chan after battle with new cute and beautiful fashions to make up with. And her much brighter personality after battle and conflicts. So, how is the movie? Although it really disappointed me as Hayate-Chan fans in this movie but have many good points to fill up the gaps that previous Nanoha’s franchises had created. This movie still embracing old school, non-bias point of view in magic vs technology, action oriented, Nanotechnologies that will fill up for those individuals who prefer pure energy battle transformation, and improved story-telling, best villain in the whole Nanoha Franchises history, ignored parts will eventually using better ones to fill up our gaps (Like Hayate-Chan), more detailed backstories on each new Characters. The negative point is too much action that sometimes ignored some logic possibilities like how Nanoha first time use Accelerator could use better than Terminator who uses this kind of technology for YEARS?! And Nanoha Magic Stamina is “INFINTE” while confronting Terminator. And Nanoha loses her right arm, but in the end, she grew her limb back?!!! Not prosthetic arm, but real biological arm. Self-destruct without killing Nanoha?! Maybe Nanoha triggering emergency protection, I really wish the author can explain this. So, the review of this movie is 8/10. Such a masterpiece that many new anime industries try to avoid and ignore it while following the trends of Harem, Eechi and weak storylines. If you combine Detonation movie with Reflection movie, it is positively 9/10! So, I recommend every Nanoha fans to watch it. Even for very picky fans like me on ideologies, technologies, politics and different point of views, you will not regret watching it. I will post this review first then later posting “Nanoha Detonation movie in a nutshell” pictures to you guys. Is there any NanoFate scene? I'm sorry if I recalling very little for you. - Cute scene, after Nanoha mysteriously regained her right arm while in Midchildan Hospital, Nanoha keep insist Fate that she can peel apple skin or even walking normally. And Fate acting like Fate that she keep rejecting Nanoha's persistence while peeling apple skin for Nanoha to eat apple. - Badass scene, before Nanoha almost got killed by scientist, Fate appeared in the nick of time to block his deadly strike. Together, the Love of NanoFate power combined, both using Excellion Busters to tear Terminator's body apart hardly. Although did not entirely destroy that scientist upper body that included his consciousness and his memories.Because of this, scientist still have an opportunity to launch his worst case scenario plan "Nuke down whole Tokyo". That sounds nice, thanks for the info Jinsen. Here is the whole movie in a nutshell powerpoint. As promised. Again Warning: If you don't want to spoil yourself, please refrain read this if you don't want to ruin your experiences on watching this movie. Epic as F***! I love it! Better than Destine Prelude. Best Battle theme for Dearche, Stern & Levi saving Yuri from virus control. Cute music for before <<Never Surrender>>, best for Hayate-Chan & her friends during graduation. I see. Although I personally haven't seen it in the cinema yet, but after listening to these songs, I really want to experience that feeling. Now Im more hype to see the movie! Maybe theres a chance they make a movie about nanoha's accident and their middle schooler life now that they graduated from elementary.